(Nanowerk News) Researchers at Oregon State University announced an important advance in the field of cancer imaging and phototherapy, using a single-agent system that may ultimately change the efficacy of cancer surgery and treatment around the world. The newest approach developed at OSU uses a single chemical compound, silicon naphthalocyanine, that has both diagnostic and therapeutic value. It makes cancer cells glow when exposed to near-infrared light, so a surgeon can identify the cancer and more effectively remove it. At the same time, this compound creates heat and reactive oxygen species within any remaining cancer cells, killing them. In tests completed with laboratory animals, tumors were completely eradicated without side effects, and did not return. The findings were presented today at the annual meeting of the American Association of Pharmaceutical Scientists in Orlando, Fla., and were also recently published in Chemistry of Materials ("Naphthalocyanine-Based Biodegradable Polymeric Nanoparticles for Image-Guided Combinatorial Phototherapy"). When perfected, researchers believe that the evolving field of phototherapy may become a new and promising addition to the three primary ways that most cancer is treated today: surgery, radiation and/or chemotherapy. Phototherapy clearly has the potential to make some of those approaches more effective than they already are. Since this is a different form of therapy, however, it may have special value with cancers that have formed resistance to chemotherapeutic drugs, or present other problems that can't be managed with existing therapies. "We've now developed an improved formulation that's biodegradable, simple, robust and reproducible," said Olena Taratula, a research assistant professor in the Oregon State University/Oregon Health & Science University College of Pharmacy, and lead author on the published study. "This system that can make cancer cells glow is like giving the surgeon an extra pair of eyes," she said. "And the compound we're working with now is inexpensive and appears effective at killing any cancer cells that remain." Research so far has studied ovarian cancers in laboratory animals, but the researchers said that conceptually the treatment may also be useful for other solid tumors. There were no apparent side effects on animals tested. The system that helps deliver the silicon naphthalocyanine to cancer cells is an alternative to a dendrimer-based delivery system reported earlier this year, and uses a copolymer called PEG-PCL as the biodegradable carrier. The carrier causes the silicon naphthalocyanine to accumulate selectively in cancer cells and reach a maximum level in them after about one day, at which point surgery and phototherapy treatment would be done. The compounds are then naturally and completely excreted from the body. "A single-agent based system is simple and very good at targeting only cancer tumors and should significantly improve outcomes," said Oleh Taratula, an assistant professor in the Oregon State University/Oregon Health & Science University College of Pharmacy, who presented this work today at the American Association of Pharmaceutical Scientists. "It's small, nontoxic and highly efficient." In continued research with the OSU College of Veterinary Medicine, the treatment will be used on dogs with actual cancerous tumors, before eventually moving on to human clinical trials. Collaborators on the research include Oleh Taratula and Adam Alani, the corresponding authors and assistant professors in the OSU College of Pharmacy; and Shay Bracha, a veterinary oncologist, and Milan Milovancev, a veterinary surgeon from the OSU College of Veterinary Medicine. The work has been supported by the OSU College of Pharmacy, the OSU Venture Development Fund, OSU General Research Fund and the Medical Research Foundation of the Oregon Health & Science University. 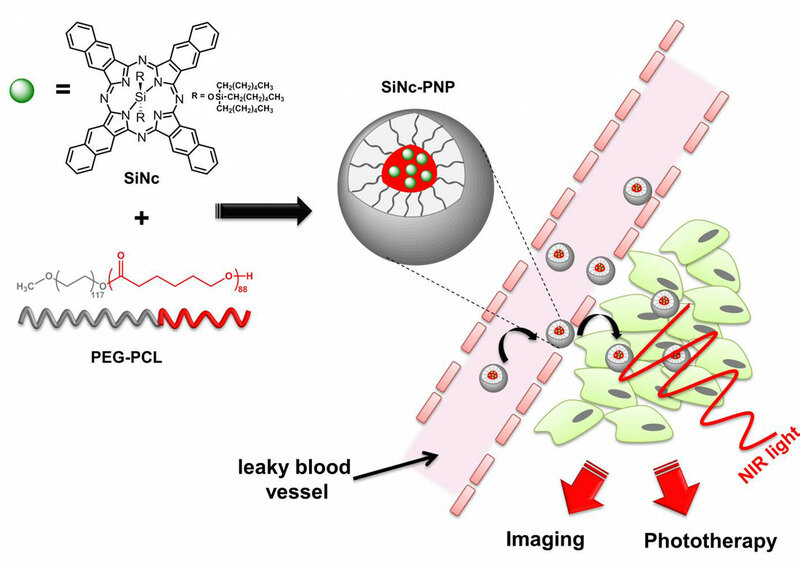 "Our strategy provides cancer imaging with a single-agent theranostic nanoplatform and subsequent phototherapeutic treatment with great potential for clinical translation," the researchers wrote in their conclusion.